If you talk to any beauty expert, they’ll tell you that the key to getting that dewy glow is moisturize, moisturize, moisturize. While there are products that assist in amplifying that glow (read: highlighters & illuminators, bb creams, facial sprays), the bottom line is that your skin must be well-drenched before applying any of your other beauty products. 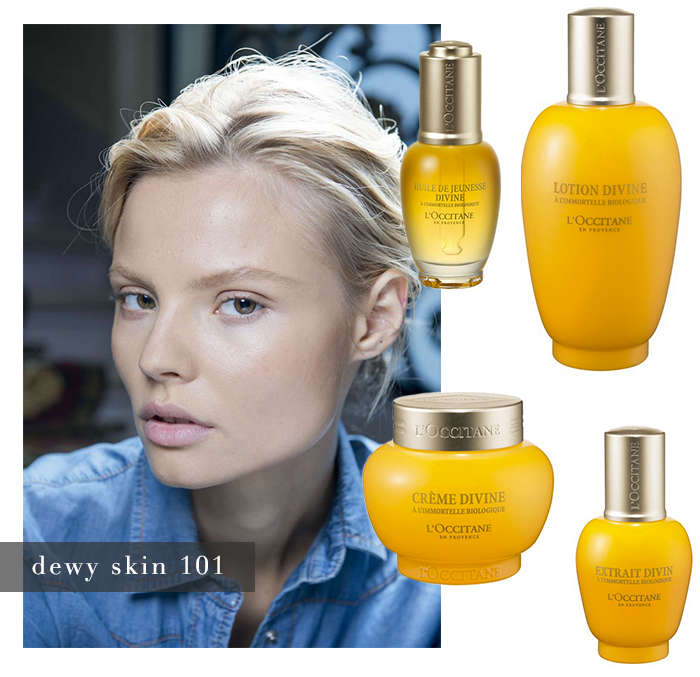 I was first introduced to L’Occitane’s Divine Collection a year ago, when I received some full-sized samples at a fashion week party, but only had the chance to try them out for the first time last month. I am a creature of habit, so I don’t change up my beauty routine very often (staples in my skincare routine include this gel cream, these cleansing wipes and this foaming face wash), but I finally gave in. I’m actually kind of mad at myself that it took me this long to try out this collection! While the Divine Collection is more focused on it’s anti-aging properties, it was the intense moisturizing capabilities that have sold me on the products. My favorite from the collection? The Creme Divine. It’s a thick, lustrous cream that I massage onto my face and neck before bedtime. My skin stays silky all night – I wake up and it feels like I just applied it. The Creme Divine is very long-lasting, but doesn’t leave any residue behind, which is why it’s such a rockstar product. It gives you that youthful, radiant glow without leaving oil pockets on your face. Some other products from the collection that are worth your attention include the Immortelle Divine prep/toner lotion and the Divine Youth oil. Give your face a fresh start each morning by applying the toner before starting the rest of your skincare routine. It’s a softening lotion, which prepares your skin for maximum absorption and retention of the Creme Divine moisturizer. If you’re looking for an extra glow for special occasions, apply a small amount of the Divine Youth oil right before slathering on your moisturizer. Shop the entire Divine Collection below! You can thank me later. I have been using their lavender hand creams for years but I have never tried the facial cosmetics. The packaging reminds me of Darphin. Thank you for the tip, I will definitely ask fora sample when I am next time in L’Occitane!